finely chop macadamia nuts. mix well with rice krispies. set aside. shape the mixture to a rectangular shape and place it on a parchment paper and place in the freezer. when the shape is set after about an hour, cut into two pieces (each piece is one serving), transfer to freezer friendly container and keep in freezer until ready to serve. Let it sit in room temperature for about 5-10 minutes before serving. The recipe does not use real marshmallows. The Walden Farms line of products (including the marshmallow dip) are calorie, fat and sugar free. 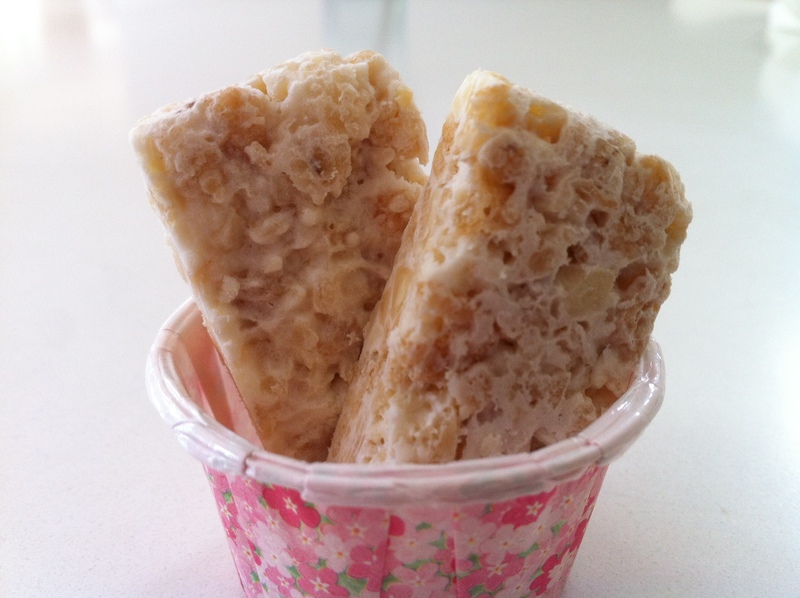 Rice crispies, while they are a high carb food, are possible in limited quantities depending on ratio and carb allowances. Some recipes like this are considered a “treat” and factored into an entire days worth of meal plans. it should be ok. since it is hardened in the freezer, the butter will harden like regular butter. i wouldn’t leave it out in room temperature for too long if you have more butter since butter will soften. Would I be able to increase the butter on this to increase the ratio? Would it still hold together? These were a big hit – thank you! Where it says T in the ingredients is that Tablespoon or teaspoon? I would weigh it out anyway right? Thanks! T is for tablespoons, t would be teaspoons!